You know how great ideas seem to come to multiple deep thinkers at the same time? 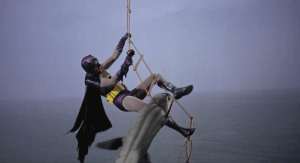 There is a scene in the 1966 “Batman” movie where the caped crusader fought an exploding shark. At that exact moment in history, the U.S. Navy was in the middle of a 13-year project to develop exploding sharks! The Navy’s complicated plan was to turn sharks magically into maneuverable torpedoes using a headgear that delivered shocks to steer the sharks towards enemy targets. The shark’s entire course would be pre-programmed into the headgear, which could sense whenever the sharks were straying off-course. Shark biologists teamed up with gadget-man Snodgrass to develop the sophisticated course-tracking mechanisms that also shocked the sharks. These stealthy predators of the sea — the top animal in the undersea food chain — would be used to create a strategically significant army of attacking fish. Sharks draw oxygen gradually out of the water using their gills their bodies have a uniform density, which hides them from sonar systems which are searching for differences in density. 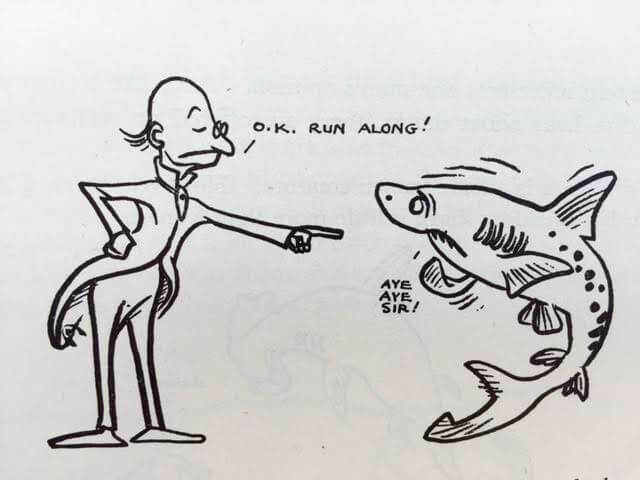 Despite the failure of the program, the Navy’s original shark idea had some merits. Sharks are stealthy — much quieter than dolphins — and can also swim long distances. And unlike dolphins, sharks are even invisible to sonar. Sharks draw oxygen gradually out of the water using their gills their bodies have a uniform density, which hides them from sonar systems which are searching for differences in density. Finally, “Should the mission fail,” the report notes that a dead shark will just sink to the bottom of the ocean — rather than floating indiscriminately to the surface with a Navy-issue headset. Interestingly, even that shark repellent made an appearance in the 1966 movie “Batman,” in which Batman fights an about-to-explode shark that’s latched on to his leg. “Holy sardine!” shouts Robin, as Batman punches the shark, but to no avail. He resorts to his extensive collection of oceanic repellent sprays — which includes shark repellent — then later tells the press it was “an unfortunate animal who chanced to swallow a floating mine,” (adding “I wouldn’t worry about that). So even while the Navy was pursuing their secret classified program to weaponize sharks, Hollywood was making a movie where the same tactic was being deployed by Catwoman, Joker, Penguin, and The Riddler. Adam West, Burt Ward, and Julie Newmar reunite for animated Batman movie. Science fiction legend William Gibson answers fan questions on Gizmodo. Recording artists accuse YouTube of profiting from pirates. Microsoft helps develop a temporary tattoo that lets you control devices. Ten former Twitter employees confront the free speech vs. abuse conundrum. Earthquake-stricken regions in Japan attract tourists using Pokemon Go. “Chewbacca” actor writes a very touching eulogy for recently-departed R2-D2 actor Kenny Baker. If motivational posters used quotes from R2-D2. How we trained AI to be sexist.